I’m somewhat of a grump about bread pudding. It’s not that I don’t like it, but to me, bread pudding is something you eat at home, like fruit salad. I don’t need someone cutting up a bowl of fruit for me nor do I need someone tearing up leftover bread and serving it forth. 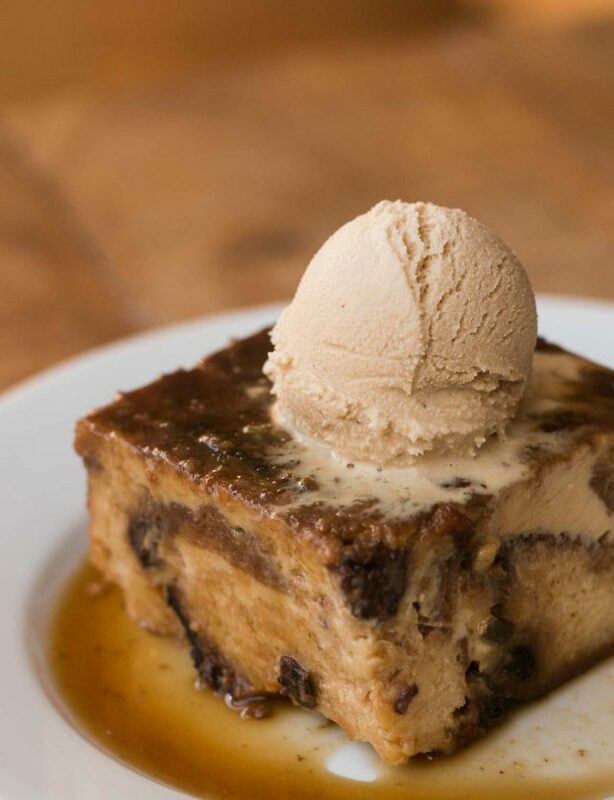 Bread pudding is home cooking fare, but if you want to go out and shell out some big bucks for a bowl, that’s fine with me. But once you taste this one, I doubt you’ll find a better one anywhere. I was inspired to make it while paging through Autentico, by Rolando Beremendi, a terrific book on how to cook authentic Italian cuisine, but without all the preachy baggage. It’s fresh and modern. Sure he’s an evangelical for using the best Italian ingredients, but he makes his case by showcasing some of the beautiful products they have in Italy (Rolando owns Manicaretti Italian food imports, which are sold at Market Hall Foods), such as Tuscan farro, which I used to make his Farro torta the other day, spicy peperoncino piccante (red pepper paste), Sicilian capers, and jars of honey that range in flavors from chestnut to eucalyptus, depending on availability. During the holidays, panettone starts showing up on the shelves at markets and food shops. But not just in Italy; panettone has become popular around the world. 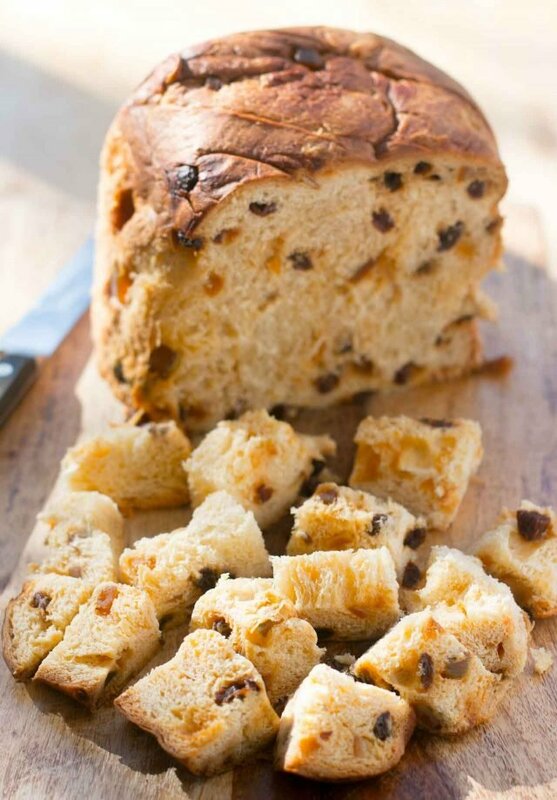 The sweet bread is usually studded with candied fruit, citrus zest, and raisins, which bakers often take in different directions, adding everything from chocolate to caramel. Rolando’s Budino de panettone intrigued me, using panettone as a base, topped with demerara sugar. 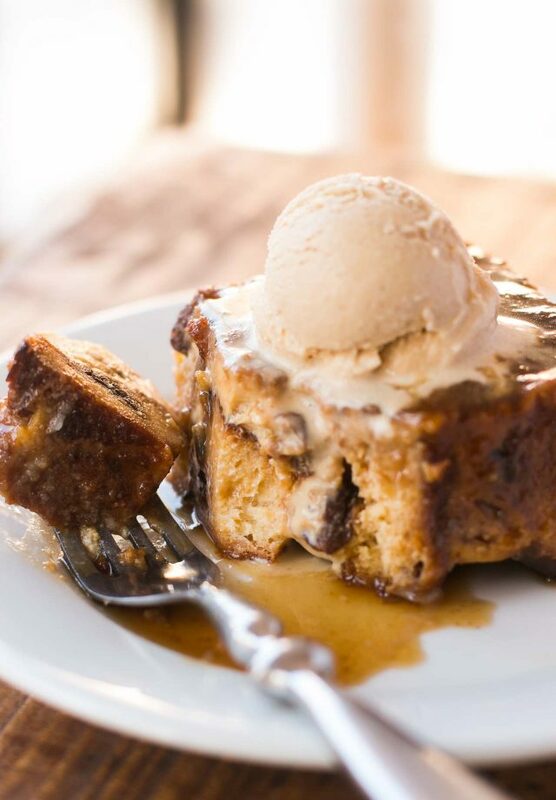 So I used his budino as inspiration for this bread pudding, baked in a pan where brown sugar had been moistened with butter, so it creates a juicy, caramel-like topping, with the bonus of additional sauce to spoon over the bread pudding when it’s turned out. It’s not swimming in sauce, but has just enough so that anyone who wants an extra spoonful can have one. And who deserve an extra spoonful of sauce? It’s that time of the year, when you may be gifted one too many panettoni. And while you might not think it’s possible to have too much panettone, this is a welcome reprieve from French toast or panettone ice cream, if you do find yourself with an overload of loaves. Inspired by Autentico by Rolando BeremendiBecause of the brown sugar, that makes a nice, caramel-like sauce while the bread pudding is baking, you've got some leeway with the granulated sugar. I used 1/2 cup (100g) in the custard, but you can dial it down to 1/4 cup (50g), or anywhere in between, since panettone is already sweetened. (And they vary in sweetness, too. 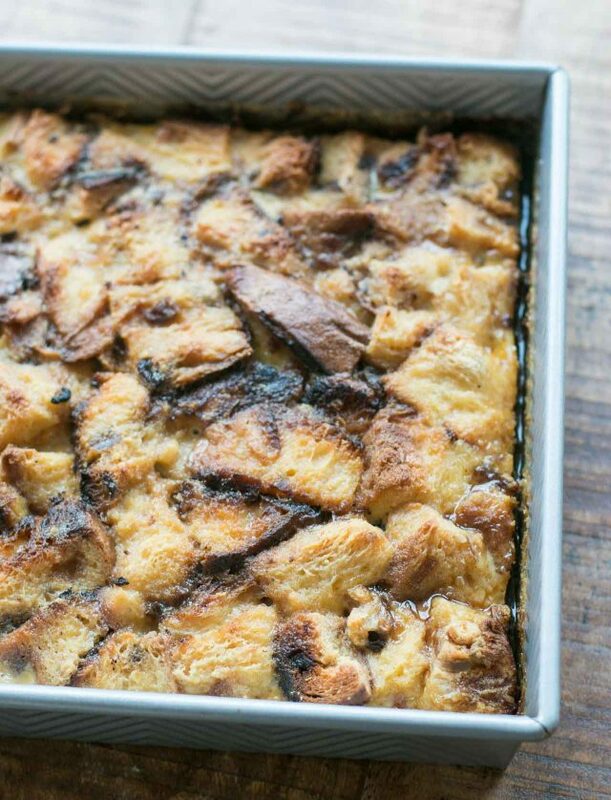 )If you don't have panettone, you can make this bread pudding with brioche or challah. Since those breads aren't so sweet, I'd use 1/2 cup (100g) of granulated sugar.I have a fairly heavy-duty square cake pan so I melted the butter and brown sugar together right in the pan on the stovetop. If your pan is flimsy, and you're concerned, you can cook the butter and brown sugar together in a saucepan, then pour it into your cake pan. Don't worry too much if the brown sugar is a bit thick and/or lumpy; once baked, it'll smooth out nicely. 1. Preheat the oven to 350ºF (180ºC). 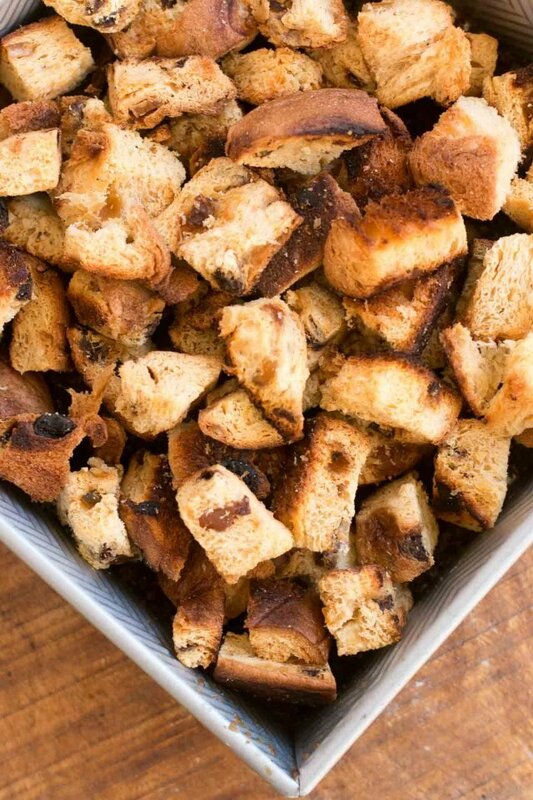 Spread the cubed panettone on a baking sheet and toast in the oven until lightly browned, turning them over once or twice during baking, so they toast relatively evenly. They'll take about 20 minutes or so. 2. While the panettone is toasting, warm the butter in a sturdy 9-inch (22cm) square cake pan over low heat on the stovetop with the the brown sugar, stirring until the butter is melted and the sugar is moistened. Use a spatula to coax it so it covers the bottom of the cake pan, with no bare spots. Remove from heat and set aside. 3. Arrange the toasted panettone cubes evenly in the cake pan. 4. Whisk the eggs together in a medium bowl with the vanilla extract, salt, and granulated sugar. Gradually whisk in the milk until well-combined. Pour the custard over the panettone cubes and press down gently to make sure all the bread cubes are soaking in the custard. 5. Put the cake pan in a larger pan, such as a roasting pan, and fill the larger pan with hot water so it reaches halfway up the outsides of the cake pan. Bake the bread pudding until it feels barely set in the center, but don't overcook it, about 50 minutes. Remove from the oven, and wearing oven mitts, carefully lift the bread pudding out of the water bath and set it on a cooling rack. 6. If serving it warm, let the bread pudding cool for at least 30 minutes. Run a knife around the edges to loosen the bread pudding from the pan and set a large serving platter or rimmed baking sheet upside down over the bread pudding. Grasping both the cake pan and serving platter, simultaneously turn both over, being careful to avoid getting any of the warm brown sugar sauce on you. Remove the cake pan, and cut into squares for serving. 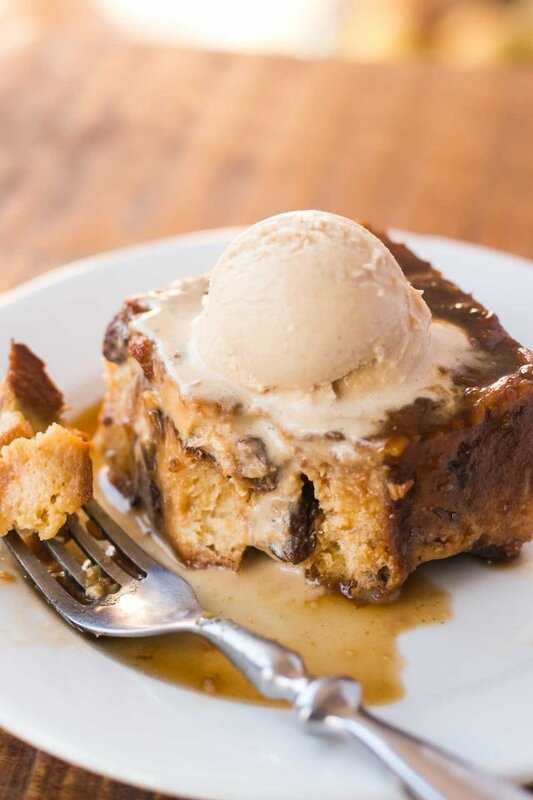 Serving: Some like their bread pudding warm, but this one is equally good at room temperature, or even chilled. 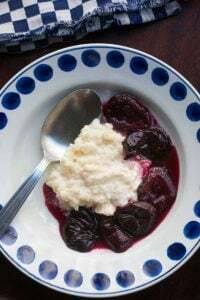 You can serve it on its own, with a pour of heavy cream (or whipped cream), or a scoop of your favorite ice cream, such as Vanilla Ice Cream or Cinnamon Ice Cream. 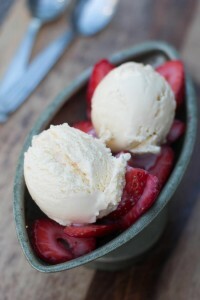 I served mine with Sorghum Ice Cream. Storage: You can refrigerate the baked bread pudding for up to three days. If you want to make it in advance, you can store it in the cake pan, then unmold it before serving. This sounds fabulous and will be a good solution for the results of my repeated attempts to bake panettone at home … not cracked it yet. Any tips on how to cook it through without burning the outside? well, at least I’ve got the Normandy butter :) And neither of my two attempts was so bad I had to bin it. “Failed” bread is nearly always edible. If only in bread pudding. 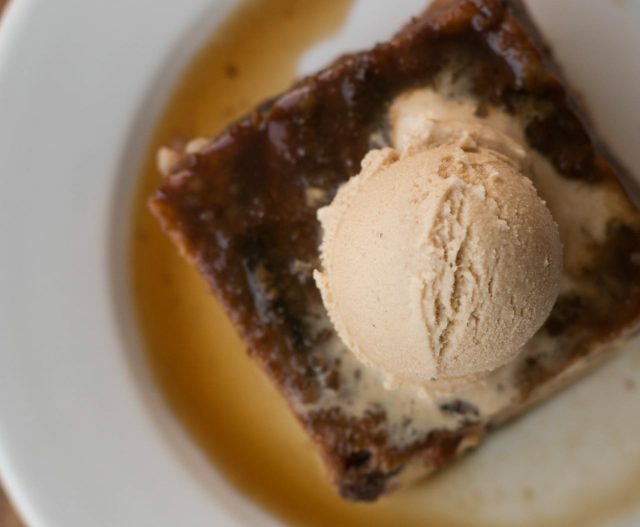 Can you freeze the cooked bread pudding? I would love to make this for my DIL but if it has to be used in 3 days makes it a bit difficult. Custards and custard-based desserts tend to get soggy when frozen so I don’t tend to freeze them. But if you do, let me know how it turns out. I’m going to make this as the dessert for Christmas Dinner. I’ll let you know how it turns out. I made this last night for Christmas dinner. The problem (which really isn’t a problem) was I also made David’s Ricotta cheese cake with Orange and Aniseeed which people just loved. But they also really like the Panettone bread pudding, especially how it smelled. It was extremely light and it’s consistentency reminded me of a flan. It was very easy to make and I would make it again. This sounds delicious using an inexpensive panettone, but is a waste using good panettone like “Panettone from Roy”! Good panettone is ethereal and can’t be improved upon in any way except spreading good French butter on it after it’s toasted. Exactly. Toasted with butter is The Best. But then, people give these loaves as gifts and you can end up with a couple – this recipe is for those occasions! Right on Fred! I say don’t mess with a good thing. Do you know what makes panettone taste like panettone? I have been trying to make it at home from Carol Fields recipe for several years. What I make tastes good, but it doesn’t taste the same. The King Arthur store sells something called, “Fiori di Sicilia,” which is suppose to be the authentic flavor. But, trust me (as our President keeps saying), the stuff tastes horrible. Jake, I’ve been trying that recipe too! I can’t get the texture right, and I keep burning the bottom, but luckily it does taste good :) Maybe it’s the quality of the butter you use that makes the difference to the flavour? A couple of thoughts about the burning on the bottom of panettone—get your oven atmosphere very humid at the start with spritzing. Moist air transfers heat much more quickly to the bread because, as it condenses on the cooler surface of the bread, it condenses which releases a lot of heat into the bread without burning it. This is to accomplish the famous “oven spring,” which is important with panettone. Then, when you turn the heat down, turn it down pretty low—to around 300 and bake it longer. I don’t use a baking stone for sweet breads because too much heat gets transferred from the bottom. Okay, you probably know all that, but these things (sometimes) work for me. The recipe I use calls for 2 tsp single-strength vanilla, ½ tsp orange extract, and ¼ tsp lemon extract in a 1200 gram (total weight) loaf. The flavor and aroma are ethereal— delightful, yet almost-not-there. I have not tasted KAF’s Fiori di Sicilia, but I’m suspicious of its quality and the fact that they push its use I’m so many recipes: why would one want everything to taste like panettone? 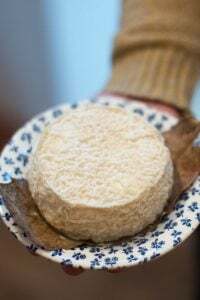 Flori di Sicilla tastes wonderful when a small amount is added to a lightly sweetened yeast dough. 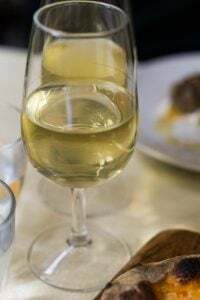 It Is not intended to be tasted straight; it is a concentrate. I don’t know if it provides the characteristic flavor to Panettone, I just know that I hate the boxed panettone sold in the grocery stores during the Christmas season. In this case, I would have to say that homemade is best; likewise stollen. To me, the King Arther “Fiori di Sicilia tastes of artificial vanilla. (BTW I have never tasted it straight.) But tastes differ. If it tastes good to you, definitely use it. Vanilla and citrus extracts. Interesting because my late Mother’s delicious yellow cakes used the same sort of flavoring. 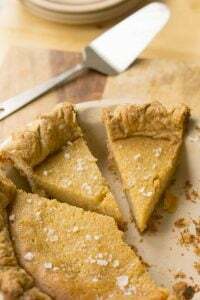 She always used a small amount of lemon extract along with the called-for vanilla. I love Fiori di Sicilia! It’s very strong, so you shouldn’t use more that 1/4 teaspoon. It’s just vanilla and citrus, so how can it be horrible? Just don’t use too much. When making panettone bread pudding I use 1/2 cup of bitter marmalade instead of the sugar in the egg and milk mixture. The shreds of orange peel go well with the candied fruit and the jam provides sweetness to the pudding. That’s sounds like a great idea, too! Another suggestion: pannetone trifle. Poached or baked pears, pastry cream, brandy, cubes of pannetone, topped with whipped cream. What a great idea for Panettone leftover after holiday season! I can’t wait to try it soon! I’ve made a similar bread pudding twice in the last two weeks, using panettone made with chocolate chips. 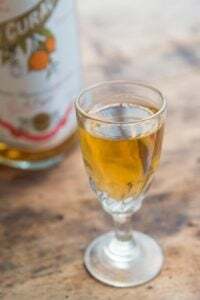 Your recipe looks wonderful but for a boozy alternative — serve with warm Amaretto sauce. Bring 1/2 cup whipping cream, 1/2 cup whole milk & 2T sugar to a boil, stirring frequently. In separate bowl, blend 1/4 cup Amaretto liqueur & 2t cornstarch. Whisk Amaretto mixture into cream & simmer 2 minutes. Yum. After much dithering, I think I now know what I’m having for Christmas! I wonder if it would be helpful to line the bottom with parchment? Or would that interfere with the browning too much? If increased by one-half, would this work in a bundt pan? David, thanks for the link to pan sizes. I made it my bundt pan that had the same volume as your 9-inch square pan. It turned out quite well, and was received enthusiastically by my Italian in-laws! I ‘attached’ the brown sugar/butter mixture to the sides of the pan. When it was unmolded, a few small bits stuck to the pan, but nothing major. The only change I made to your recipe was making a bit more of the brown sugar/butter mixture and dabbing it on the top after pouring in the custard. Re: your chocolate cherry fruitcake. I am using cherries bottled in their own juice for the recipe, so the cherries will not need to be soaked in rum for moistness. However, I am not clear if I include the one third cup and six tablespoons kitsch or rum in the recipe, or simply omit it. Please advise! Thank you, and enjoy the holidays. In step #5 of the chocolate cherry fruitcake recipe says to add the plumped cherries and any juice that didn’t get absorbed. Since I didn’t test it with bottled cherries I can’t say how much to add or if it should be omitted. My guess would be to just omit it but can’t say for sure without having tried it. Just to clarify can this be made ahead and then kept in frig till time to cook andcis so for how many days or hours. Long time fan! As you can imagine in Australia we do not go for bread pudding in the heat. Purchase the panettone on sale after the Christmas rush and freeze for the colder winter months. Agree with the marmalade inclusion, recommended on Pie in the Sky TV series and a family favorite ever since. I’m so glad I stumbled across this recipe. Definitely going to have to make it for Christmas dinner! Thank you, David!!! 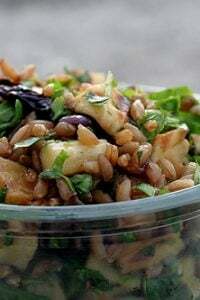 I’m making this right now and I have too many bread cubes to keep them in one layer in the 9 inch pan. 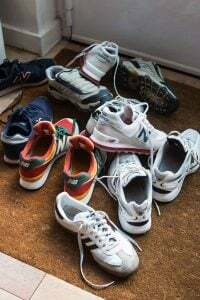 Is this a problem? Am I clueless? :) Thanks! They should all fit in the pan (there’s a pic in the post of mine) but should be roughly even on top. But when you pour the custard in and press down, you can even them out. Note that it’s not a ‘single’ layer, i.e. ; one layer of bread, but you want to spread the cubes evenly. I was trying to be descriptive but it was probably overly so, so I edited the instructions. Thanks so much for replying! Yes, I just went with my gut and loaded the pan with toasted cubes and pressed down big time. It looks amazing and is in the oven. My husband is a big fan of pannetone but may get some left to try on one of our unseasonal days. Loved your book, laughed aloud funny in sections. Wishing you a happy, healthy 2018. Question, please, about storing and serving the next day. 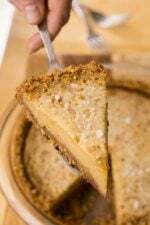 If storing in the pan overnight in the refrigerator, can it be rewarmed in the oven so that the brown sugar is gooey? I haven’t tried it, so I can’t say. If you do, let us know how it turns out. That’s what we did yesterday (stored in pan overnight after baking for 1 hour and rewarmed in oven before serving)…. came out of pan perfectly and was a delicious big hit with our holiday crowd! Thanks David! Hi David, I was able to successfully reheat this in the oven the next day. I took it out of the refrigerator and few hours beforehand to bring it too room temperature. I reheated the pudding at 350 degree oven for about 12 minuets. I was able to flip it out of the pan onto a serving platter and the brown sugar/butter topping was nicely melted. Thank you so much for a wonderfully tasty dessert. 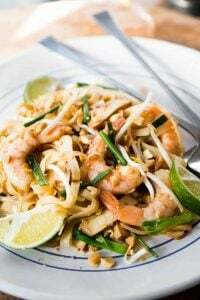 I know as soon as I saw this recipe it was what I wanted to serve my family. Burned half of the cubes..at 15 minutes…so I replaced with sourdough cubes. Excellent!!! This looks amazing and I am intrigued. I didn’t quite know what a panettone was until I came across your article. I’ve had a sheltered baking life. This makes me want to make both the bread and the pudding. I made this for my Xmas dinner! Oh…yum! My only “bad” was that I didn’t cook it enough …the center of the dish was still on the mushy side. The taste, on the other hand, was out of this world. I got another panettone bread to do up at a later date! Kudos, David on a great recipe! Question: Why does panettone bread last so long on the shelf. My second loaf that I got gave it 6 months Best Before date. Amazing! I made it as written with one exception … I added a generous 1/2 cup of Amarena cherries (minus the syrup) that I bought at Trader Joe’s. My Christmas guests raved and the leftovers were heavenly the next morning with a cup of hot tea. Thanks David! After assembling this on Christmas morning and storing in the fridge, I baked it in the afternoon before my guests arrived. It was a a great success and came out perfectly! The only tricky part was taking it out of the oven with it’s hot water bath. The leftovers held up great, too. Yum, I will add this to next year’s menu for Christmas. Does it work well if served up by large spoonfuls or cut squares directly from the baking pan, like many bread puddings? Yes, received a gift of a half of a panettone… augmented it with some good Italian bread made with some olive oil. Needed a pan a little larger than nine-inch square. Tore the bread instead of cutting it. Added an extra cup of milk and two extra eggs because I love the custard. Grated nutmeg over the bread before pouring over the custard mixture. 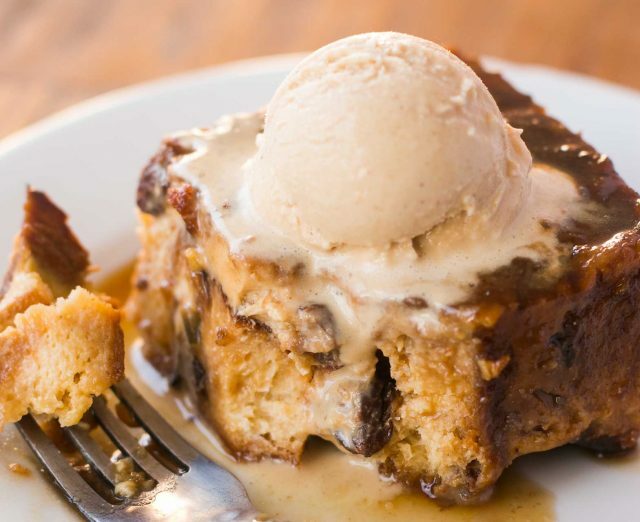 Absolutely the best bread pudding I have ever tasted! Thank you, David!!! For the record, this is absolutely wonderful with Santa Lucia buns left over from Christmas (I use the recipe from one of the Silver Palate books for the buns, which is sort of like brioche with saffron, raisins and ground almonds). They go stale so quickly and I’m really excited that I now have a good way to extend their life a few more days! Happy New Year!